There are many ways to tell the story of our troubled economy. This one is told through poodles, terriers and spaniels. Inside a Ballard pet store Saturday, volunteers in “Got Dog?” T-shirts stroked and gently placed in kennels some two dozen dogs up for adoption, encouraging them to stop barking and behave before the crowds gathered. There was a Chihuahua, Mazie Mae, given up by a Yakima kennel that had gone out of business. Nearby sat a velvety black pug given up because its master couldn’t afford his mortgage and lost his house in Spokane. Like all pet-adoption events, the one at the Ballard Petco had its share of dogs who got there because they had been neglected or abused. More telling, though, were the dogs given up recently because pet stores had gone out of business or pet owners had lost their homes and had to move to apartments that didn’t allow pets. 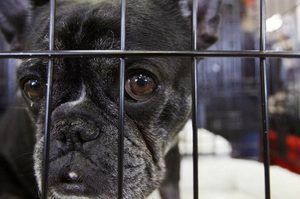 Some of these dog owners “had lost their homes and their jobs, or they moved into their parents’ homes and they have nobody to take care of their dogs,” said Ginger Luke, owner of Ginger’s Pet Rescue, who organized Saturday’s event. In tough times, said Luke, kennels and pet stores can’t find customers willing to pay $1,800 for a purebred King Charles spaniel. Luke should know. She has six abandoned because a kennel couldn’t sell them. She has found owners for two of them. A third — a 3-year old with a brown-and-white coat named Samuel Adams — was showcased Saturday, giving passers-by a lost-puppy look. Luke charges $150 and up in adoption fees to help cover a portion of each dog’s vet bill. She trains and grooms the dogs before offering them up for adoption. I saw your rescue operation in Edmonds at the Petosa’s/IGA parking lot. I am touched and am not sure how to get involved with dogs, my love. I had a massage client who knew you Ginger and I did meet you that day.